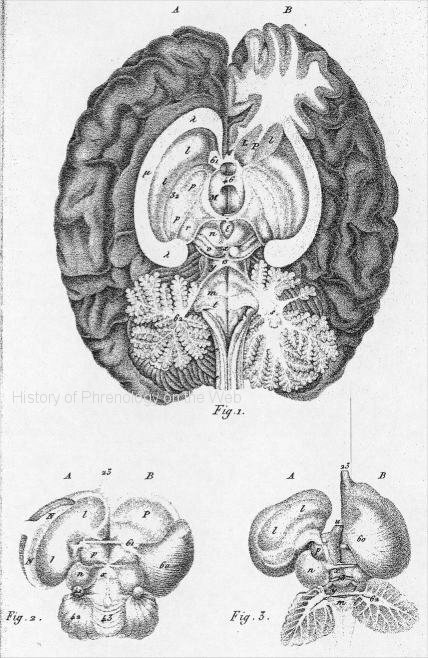 In this work Spurzheim made bold claims about what he represented as his own discoveries and techniques in the anatomy of the brain. How much he in fact borrowed from F.J. Gall, his long term master, is yet to be demonstrated. Spurzheim also reproduced in this work portions of text written by Gall in his earlier work. Below are the 11 plates, many of which Spurzheim took from the 1812 atlas to Anatomie et physiologie du système nerveux published together with Gall. The preface, reproduced below, provides interesting details about Spurzheim's relations with Gall and claims to independence from the shadow of the more famous Gall. 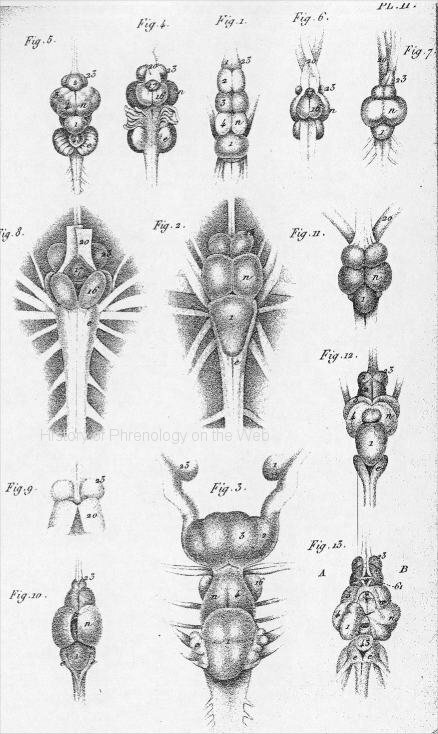 Compare Spurzheim's plates with those from William Carpenter's Principles of mental physiology, 1874, Appendix pp. 709-722. THE affective and intellectual faculties of man, both in their healthy and diseased condition, are unquestionably dependent on the body ; and, among the various branches of anthropology, anatomy is the basis of all the others. The organic apparatuses, which are indispensable to the mental manifestations, consist of the brain, cerebellum, spinal cord, and the nerves of the external senses and voluntary motion. To make known the structure of these parts is the special object of this volume. mencement of the vulgar era, was the first who discovered the connexion of the nerves with the brain, and who looked on them as the instruments of sensation. Erasistratus divided the nerves into those of sensation and those of motion; the first he derived from the brain, the second from the membranes. Galen held that the nerves of sensation arose from the brain, and those of voluntary motion from the spinal cord. In the sixteenth and succeeding centuries the brain and nerves were subjects of much research, but it is only in our own times that they have begun to be understood,-that their true structure has been discovered, and that new and unthought-of functions have been proved to belong to them. The nervous being the most delicate tissues of the body necessarily required extremely careful and often-repeated examination to be understood, and this they could not receive during ages when prejudice opposed insurmountable obstacles to the dissection of dead bodies. It is therefore easy to conceive why such slow progress was made in the anatomical knowledge of the nervous system. Dr. Gall is the original author of a new physiological doctrine of the brain. The discovery of the ground-work of this is all his own, and he had even gone very far in rearing the superstructure before the year 1804, when I became his colleague. From this period we continued labouring in common, until 1813, when our connexion ceased, and each began to pursue the subject for himself. The works which Dr. Gall has published in his own name fix the extent of his phrenological knowledge. My ideas, too, are developed in my own publications: history will assign to each of us his share in the works that have issued under our joint names. * Exposition de la Doctrine de Gall, par Froriep, 3me edit, 1802.
spirit of this gentleman's researches was merely mechanical, as is allowed in our joint work, entitled " Anatomie et Physiologie du Systeme nerveux en général, et du Cerveau en particulier*." * Preface to the first vol. p 16. † Gren's Journal, 1795, i. p. 102.
was not correct ; for he thought that the convolutions resulted from the duplicature of a membrane, believing that the cerebral crura entered the hemispheres on one side, expanded there, and then folded back on themselves by the juxtaposition of the convolutions. 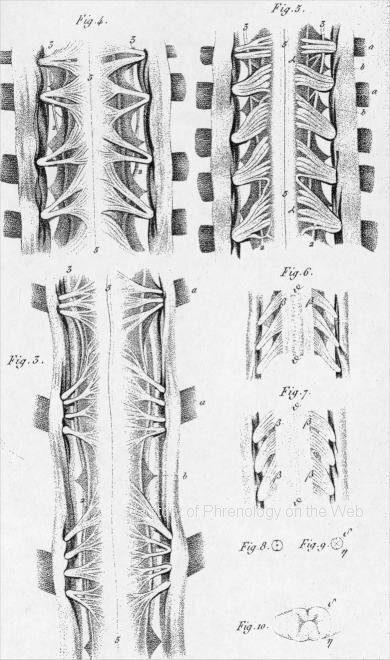 The true structure of the convolutions, and their connexion with the rest of the cerebral mass, were not described until our joint Memoir was presented to the French Institute in 1808.
toms, and belonging, for the most part, to the apparatus of union, or of the commissures, is pushed by the water between the two layers composing them ; lastly, I demonstrated the structure of the nervous mass of the spine, and I flatter myself with having arrived at the best method of dissecting the brain, and exposing its parts. plates because I think I have acquired a right to this volume, by its publication in our joint names, by my discoveries that form its principal object, and by all I did in furtherance of its publication. All the drawings were executed under my superintendence from anatomical preparations, made and determined on by me ; the engraver worked by my directions ; no plate was sent to press without my approval; the descriptions of the plates, and the anatomical details are mine ; and I furnished the literary notices in regard to the nerves of the abdominal thorax, to those of the cerebral column, of the five senses, of the cerebellum, and of the brain. Whoever desires more copious historical details than this volume will be found to contain, I refer to our Memoir, addressed to the French Institute, and to the first volume of our great work, commenced in common, and continued by Dr. Gall singly, after the middle of the second volume. Paris, in the first volume of his work, uses our names no fewer than fifteen times, in connexion with a single idea, which he fancies he can refute; and generally along with every fact that looks unfavourable to our opinion, he names us, but he always forgets to cite us in relation to very many fundamental conceptions which we had announced at the same time. They who have written to the following effect:—" M. Serres has proved clearly the erroneousness of M. Gall's observations, and replaced them by others," may undeceive themselves by attending to the remark I have just made. two heads, two tails, and six or eight extremities, but that it would remain strictly confined to the limits of its class, he exclaims :—" This wonderful phenomenon is undoubtedly connected with the general harmony of creation. What may be its cause ? We know it not, and in all likelihood we shall remain ignorant of it for ever. It is one of the mysteries of creation, whose surface is meted by man, but whose depths are sounded, and known to God alone *." * " Cet étonnant phénomène est sans doute hé à l'harmcmîe générale de la création. Quelle peut en être la cause ? Nous l'ignorons et vraisemblablement nous l'ignorerous toujours. C'est un des mystères de la création, dont l'homme mesure la surface, mais dont Dieu &eul sonde et counatt la profondeur." is not, in my eyes, more astonishing than any other natural event. discovery of the truth, and this is then confirmed and established by all ulterior observations. The anatomy of the peculiar system necessary to the affective and intellectual manifestations, as well as anatomy in general, admits of consideration in several ways. First, it is simply descriptive, that is, physical appearances alone are examined, such as the form, the size, and colour of parts, the tissues which compose them, and their connexions. ality of practitioners are satisfied with knowing the membraneous envelopes of the encephalon the large blood-vessels, the sinuses, the great masses of the brain and cerebellum, and the principal cavities. Of these views, however, I shall only take such notice as may be necessary to recognize the parts spoken of in my physiological and pathological considerations. * "Jusqu'à ce jour (1824) personne n'a songé à rCunir en corps de doctrine les connaissances acquises sui Panatomie, la physiologie et la pathologie du system nerveux. Je vais essaye de parcourir ce vaste sujet." I regularly delivered " a Course of Lectures on the Anatomy, Physiology, and Pathology of the Brain and External Senses," twice a year. My course was always so announced, according to the custom in Paris, by public placards ; and my auditors must recollect that in my introductory discourse, I uniformly insisted on the importance and necessity of studying these branches in connexion. From the above, it will be evident that M. Serres was mistaken when he published himself " the first to attempt to overtake (essayer de parcourir) this vast subject." Nevertheless, I most willingly allow that the principal consideration is not the having been the first to examine the nervous system : the true merit of the inquirer consists in that which he has effected, that which he had discovered, and justice in these particulars will, in time, be assuredly tendered to all. If, on occasion, I seem more especially solicitous in shewing the erroneousness of M. Series's opinions, it is only because these have received the sanction of the French Institute, whose influence is great over the public mind. structure of parts is studied in relation to their functions. This kind of anatomical knowledge is essential to practical medicine ; for without it, the seat of deranged functions cannot be understood. For this reason, therefore, my anatomical details will always be given in harmony with the physiological ideas I entertain of the apparatus destined to the manifestation of the affective and intellectual faculties. 3. Anatomy is peculiarly human, or, it comprehends the other beings of creation. 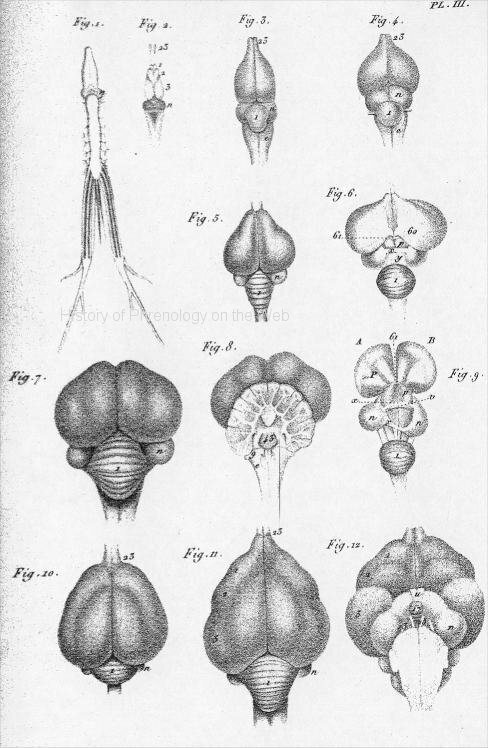 In the latter event, it is entitled comparative anatomy, and this is a field that possesses much interest for the anatomist, physiologist, ana practical physician; I shall, therefore, enter upon it at frequent intervals, always with the view of advancing the knowledge on the affective and intellectual nature of man. on Insanity. To it, therefore, I refer the reader for details. the only plan that is generally pursued. I have endeavoured, in an especial manner, to class together the parts that constitute particular apparatuses, a practice which to our predecessors was entirely unknown, as is abundantly evident from their nomenclature of the brain and its parts. Fig. I. Four ganglions, with their branches of communication, of the caudal extremity of a caterpillar. This arrangement of the nervous system reigns through, the entire length, of the body of caterpillars and worms. Fig. 2. The caudal extremity of the spinal marrow of a fowl, with, the oiigin of the three last pairs of doi'sal nerves. Fig. 3. The three superior cervical pairs of nerves in a calf, seen on the abdominal surface. The dura mater and arachnoid are slit longitudinally and turned aside, so as to expose the mode in which the nervous filaments come from the common mass, their different directions, and the passage of the bundles through the duia mater. The commencement of the intervertébral ganglions (a) is covered by the reflected membranes. Between the different pairs of nerves, the teeth of the ligamentum dentatum (e) are seen on each side of the nervous mass ; these ligaments separate the abdominal fiom the dorsal roots, and are attached to the dura mater by means of slips, naturally different in size and position. At the origin of each pair of nerves, a swelling is perceivable, varying in magnitude, ia proportion to the volume of the issuing nerve. Fig. 1. The brain of an eel seen from above. Fig. 2. The brain of a cod seen from above. Fig. 3. The brain of a skate seen from above. Fig, 4 The brain of a carp seen, from below. Fig. 5, The brain of a carp seen from above. Fig. 6. The brain of a Sounder seen from below. Fig. 8. The brain of a cod seen from below. Fig 9. The optic nerves in the cod are thrown back, to permit a view of the two roots of the olfactory nerves. Fig. 10, The brain of a pike, -with the cavity of the optic ganglion exposed. Fig. 11. The brain of a roach. Fig, 12. The brain of a barbel seen from above. Fig, 13. 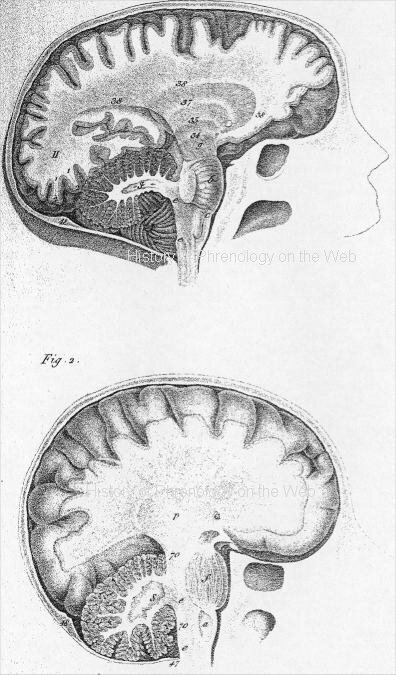 The interior of the brain of barbel, prepared to permit a view of the ganglions, their cotajnunications, and junctions. PLATE III. -Brains of Reptiles and of Birds. Fig. 1. The spino-cerebial system of a frog seen from below. Fig. 2. The brain of a frog seen from above. Fig, 3. From M, Carus's work.-The brain of a lizard (lacerta. iguana) seen from above. Fig.4. 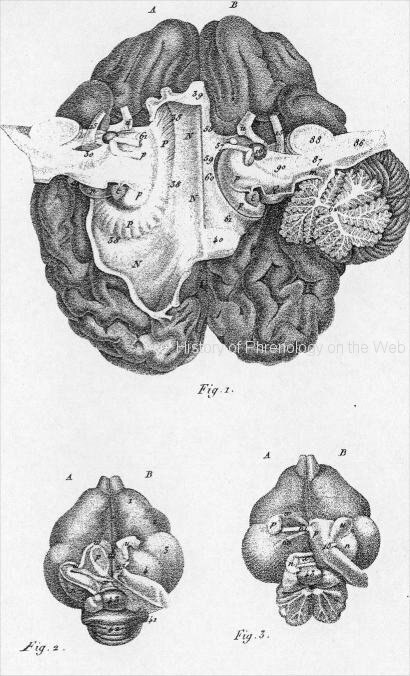 From M. Carus's work- the brain of a young crocodile seen from above. Fig.5. The brain of a common fowl seen from above. . Fig. 6. The brain of a fowl,- The two hemispheres separated. to shew the cerebellum, the optic .ganglions, 'their commissure, the commencement of the supposed optic thalimai and the part analogous to the fornix of the mammalia. Fig. 7. The brain of a turkey seen from above. Fig. 9. The brain of a common fowl, prepared to shew the cavity of the optic ganglion, the posterior commissure, - the .beginning and continuation of the great cerebral ganglions. Fig.10. The brain of a duck seen fcom above. Fig. 11. The brain of a goose seen from above. Fig, 12. The brain of a goose seen from below. PLATE IV. -Brains of Mammiferous Animals. Fig. 1. 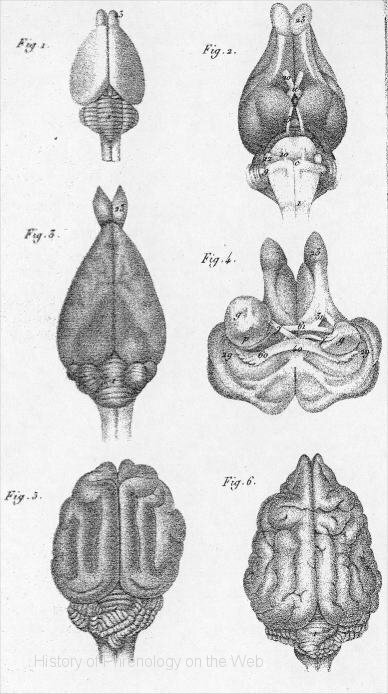 The brain of myrmesophaga didactyla seen from above, copied from the work of Tiedemann. Fig. 2. The brain of a hare seen from below. Fig, 3. The brain of a hare seen from above. Fig. 4. 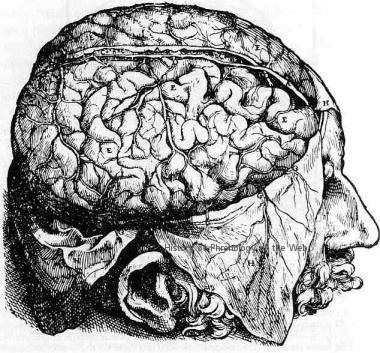 The brain of a liare placed on its upper .snriaee, like Fig 2; the mass below the crura cerebri is cut off ; the crura are separated and pushed sidewards, to see the under surface of posterior lobes; the fornix, 60; the posterior fold of the corpus callosum, 40: .the anterior pillar of the fornix y ; the anterior commisure, 61, .and, its two portions. Fig. 5. The brain of a cat seen from above. Fig. 6. The brain of a dog seen from above. All are reduced to the fourth of their natural size. Fig. 2. 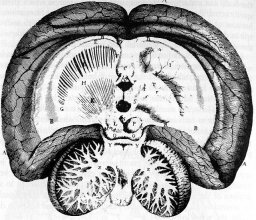 Tke brain of the monkey, sinnia capucina, seen from above. Fig. 3. The brain of the ourang-outang seen from below. Fig. 4. The brain of the ourang-outang seen from the right side. Fig, 5. The brain of an idiotic girl seen from below. Fig. 6. The same brain of the idiotic girl seen from the right side. Fig. I. The Basis of the human brain. - All the parts are in pairs, but not quite symmetrical. The brain is taken from the skull, and turned on its upper surface; the cerebellum and medulla oblongata have fallen backwards ; the different investing membranes are removed ; the cerebral and nervous masses alone are visible. Fig, 2. A skull sawed vertically tbrough the middle of the forehead, the vertex and the occiput to expose the exterior and lateral surface of the brain, cerebeîlom, aii-ular protuberance, and medulla oblongata in their Batural situations, The bone here supports the cerebellum and medulla oblongata, whilst in Fig. 1 they had downwards and backwards. Fig. 1. A skull sawed honsontally in a line from the eye-brows, by tlie middle oi t fee temples, add the tipper part of the occipital borie. The membranes and blood-vessels are removed, and the two hemispheres are seen from above. Fig. 2, The skull, brain, and cerebellum cut vertically through the median line and in their natural situations. In this preparation the various parts are retained in their proper places, not without considerable difficulty. Fig, 1. 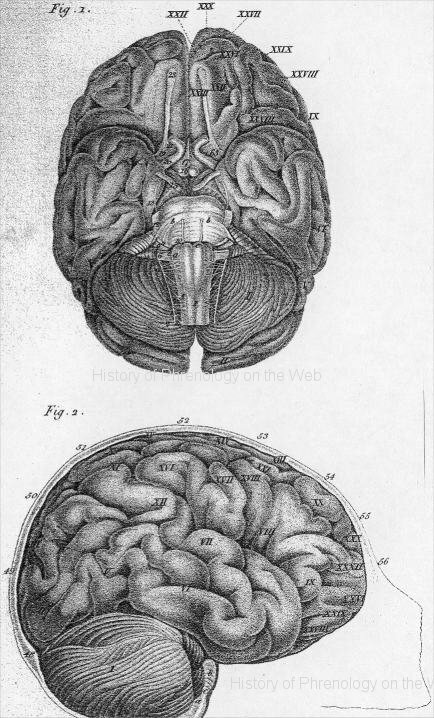 A preparation exhibiting various parts about the base of the brain. Fig. 1. The brain laid on its superior surface. 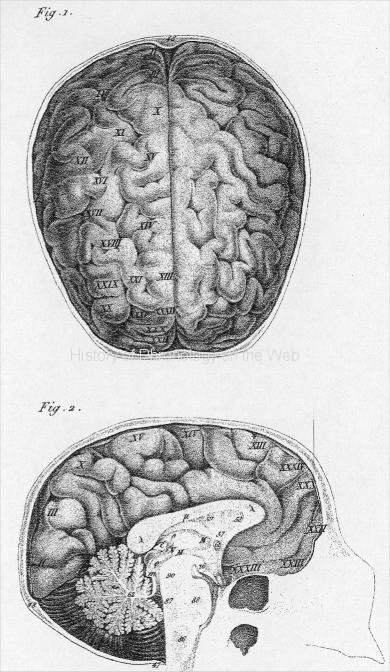 See some additional brain images in Combe's System of Phrenology (1853). Compare Gall and Spurzheim's engravings to those of earlier anatomists. Vesalius, De Humani Corporus fabrica (1543). Thomas Willis, De Anima Brutorum (1672). 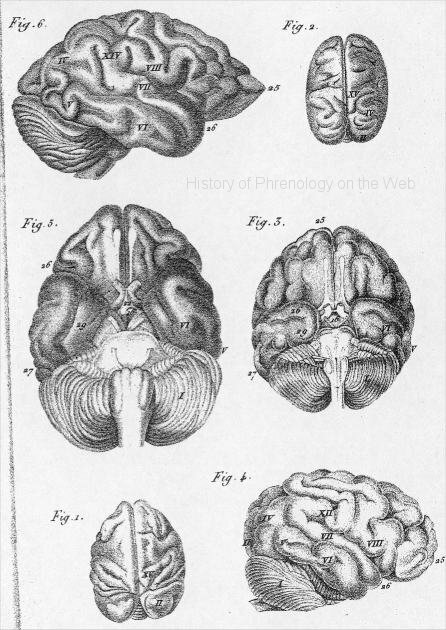 On the brain see especially: GENERAL VIEW OF THE NERVOUS SYSTEM in Combe, System of phrenology, 1850, Carpenter, Principles of mental physiology, 1874, Appendix pp. 709-722. Digital text and digital images are copyright John van Wyhe 2002.